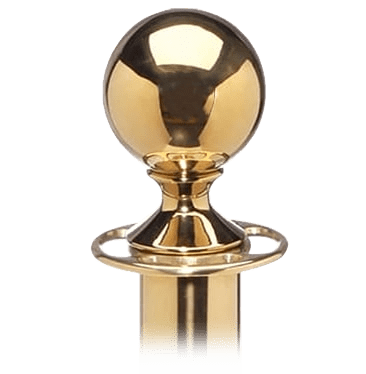 Our Elegance range of traditional rope stanchions is a premium product line manufactured from heavy gauge steel with solid cast iron bases that offer excellent durability. Polished finishes are buffed for a mirror look and satin finishes are turned in our factory for a smooth even effect. The RopeMaster range offers the sophistication of traditional velvet rope stanchions at an affordable price. Available with three post top finials and two base styles there is a RopeMaster model for every occasion. Our ropes are made with heavy duty cotton core, weatherproof twisted polypropylene or tightly woven braids all of which provide a smooth elegant drape between posts. Covers from plush velour or rich Naugahyde are available in a range of popular colors which can be matched with snap or hook ends in a variety of finishes.